First Amendment Gallery is proud to present Natural High, a solo exhibition of paintings from Los Angeles-based artist Maxwell McMaster. The work exhibited features McMaster’s vibrant color palette and his surreal landscapes. Inspired by Matisse’s iconic Le Bonheur de Vivre, Maxwell McMaster’s Natural High aims to soothe viewers from the turbulent ecosystem of our current era. With constant interruptions, updates, changes, and conflicts, there is often very little time to escape and find somewhere safe. The exhibited work is a reflection of McMaster’s effort to find peace and optimism for the future, and by aiming towards that in his process, the resulting work exuberates a feeling of calm, quiet, contemplation. Natural High a solo exhibition by Maxwell McMaster opens November 17th 12-10pm and will be on view through Friday, December 14th at First Amendment Gallery located at 1000 Howard St. in Downtown San Francisco. Gallery hours are Wednesday to Saturday, 11-6pm. To receive a preview of “Natural High” contact info@firstamendmentgallery.com. Maxwell McMaster was born in Sacramento California and currently lives and works in Los Angeles. 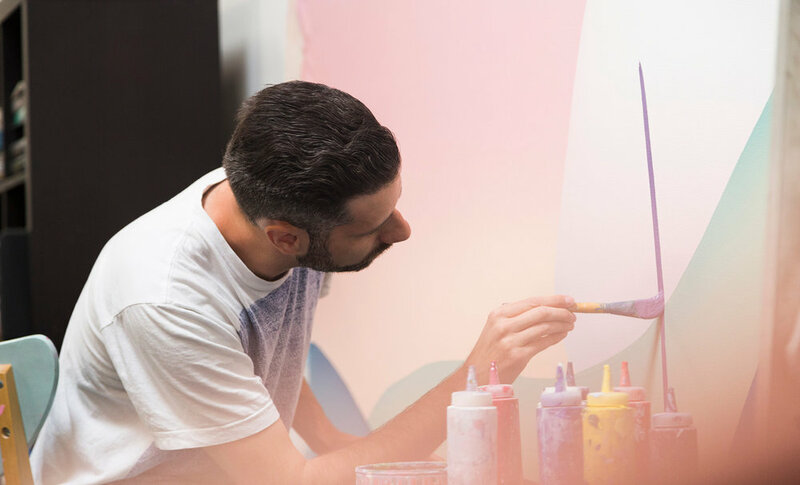 His work typically takes inspiration from his native state, integrating his keen eye for color, shape, and texture to enhance and deepen scenes from his travels and everyday life. The result is typically abstract and minimal in design, but somehow complex and emotive in appearance. The images invite viewers to reflect on life and its mysteries while reminding us of the beauty in it.